The overnight train was FULL, thus we did not get very much sleep. Passing through Austria, the train was stopped and boarded by Austrian Police ( at Brenner). They weren't looking for us. 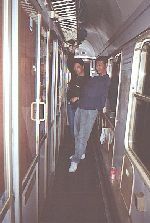 Although the overnight train would have taken us to Venice directly, it was a SLOW train. We chose to hop off the train in Verona, napped an hour in the train station, and then caught a fast (and less crowded) train to Venice. Upon arriving in Venice, we were spotted by a vulture; he offered a hotel room for 35000 Liras per person per night at the Adua Hotel. We took his offer (we needed to sleep). Room rating: GOOD (2 nights). My first impression as I walked out of the train station into Venice was WOW! And yes, there are canals. Visited the Piazza (plaza) San Marco, an open area surrounded by architecture dating from the 1400's! There were open air restaurants, bands playing, and lots of pigeons. For dinner, we went for a "tourist menu" deal: spaghetti with a glass of wine for 10000 lira. To our surprise, the portions were really small. Needless to say, we went to a bake shop to "top off the tank". There is absolutely no motor traffic. All transport is done by gondola (on the canals), by hand cart, or by foot. Therefore, it is very peaceful, especially at night. It did not stink (as we were warned it might), except in one canal where they had dammed it dry for repairs. Like a true Venice tourist, we ran into dead ends and paths with no bridges over the canals. 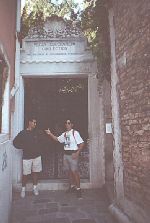 Visited the San Marco Bell Tower; click here to view the panorama! Visited the Gallerie dell'Accademia, Museo Correr (Art and History of Venice), and the Peggy Guggenheim Collection (Modern Art). The plan: Take the afternoon train on Sept 24 to Rome, Italy. For more info about Venice, click here. Here we are on the overnight train to Venice, obviously NOT getting any sleep! Waiting for a connecting train to Venice, we tried to catch a bit of sleep in the Verona (Italy) train station. Yes, the floor was very hard! This is the everyone's first view of Venice. The Stazione di San Lucia provides a wonderful introduction to Venice. The green dome is the Chiesa di San Simeon Piccolo. Yes, that's me standing by the lamp post. Here we're waiting for the Peggy Guggenheim Collection (modern art gallery) to open. And an interesting collection it is. Here, some of the local residents came out to meet us. 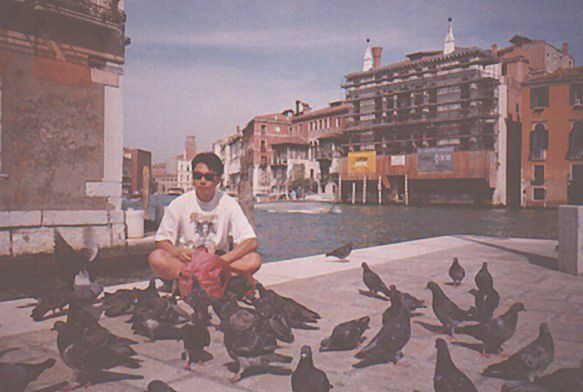 Venice is home to a HUGE pigeon population, supported by tourist. 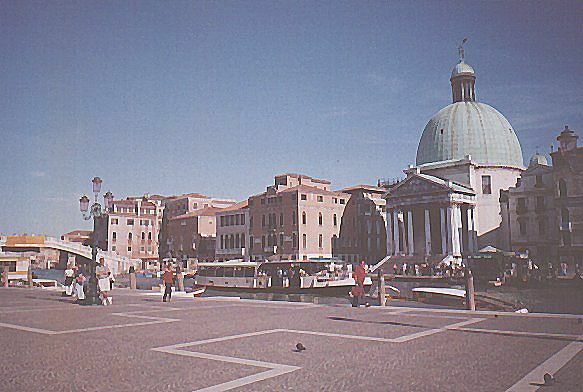 The Canal Grande is in the background. 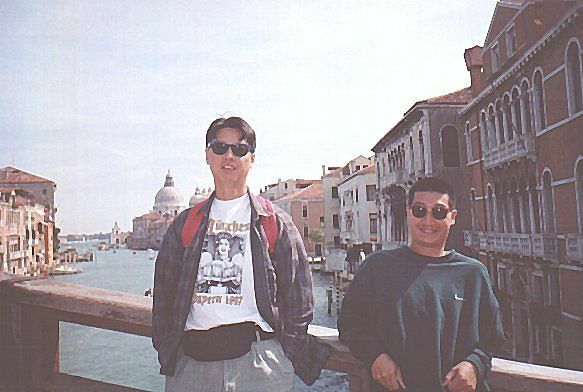 We're standing on the Ponte dell'Accademia (bridge), located over the Canal Grande. The Chiesa (church) della Salute is in the background.